Are you drunk, stoned or stupid? Maybe none apply to you, but regardless you will enjoy the game. 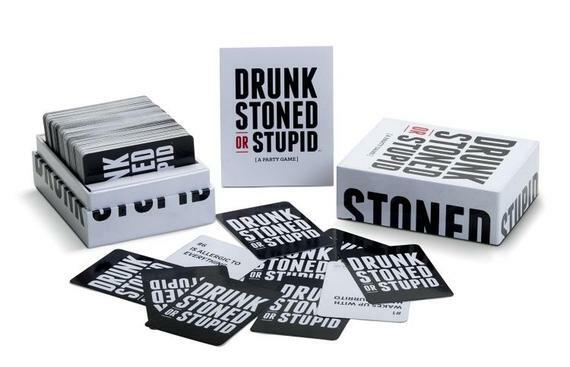 DRUNK, STONED OR STUPID is a social party game where friends call each other out for the things they do such as, going to Taco Bell sober, calling dibs on people at parties, watching "Planet Earth" for 5 hours and more. You get negative points for being given a card. There is also an alternative rule set where people who just met at a party convince the judge to give them the card for a point. This social game has a Cards Against Humanity feel but makes it more personal by calling your friends out in a funny way. The accusations can be based off anything from personality traits, past stories or anything else the judge needs to rule for the point. I was recently able to chat with Trevor and Noah Mayer, brothers from California, who created the game which has had amazing success. Here's what they had to say about their success, their company and the game. Where did the idea come from for the game? Noah Mayer (NM): "It's funny because Trevor and I aren't the gamer type." Trevor Mayer (TM): "It started when I was in college and one of our favorite things to do was share stories and give each other a hard time. One day I called my dad and was sharing our idea and how it would make for a good game and I showed him sample cards. Our dad said everything was what people would do if they were drunk, stoned or stupid and we thought that was actually a pretty good name. We then had a Kickstarter campaign and raised just shy of $11,000 to start the company." So you're in business with your dad too? TM: "Well our dad had his own company, but he's since retired and bored so he helps us out when we need it." You guys are brothers. What's it like working with your brother? TM: "It's awesome! We bickered as kids of course, but now it's fantastic working with your best friend. Plus we bring different skillsets. Noah just graduated in creative writing and I was in business and marketing. Writing all the cards is a blast together." TM: "I was working full time in finance, marketing and client services but once I saw how our sales did handed in my notice and since then have been working on it full time." NM: "I just graduated and immediately have a job. As long as Trevor doesn't give me too much of a hard time for sleeping in." How many cards are currently in the set? TM: "The main game has 250 cards and we're coming out with an expansion pack on June 8, National Best Friends Day, which we thought was appropriate. The expansion pack will have 125 cards." What are your goals for the game? It's sold at Amazon.com, Urban Outfitters, Spencer's and Kitson. Are you trying to get in any other stores? TM: "We're trying to expand into more stores and working on expanding into the UK. With that expansion are you going to translate the cards? NM: "Down the road we are thinking about that possibly translating to German, Spanish and French." Translating to other countries would definitely have some different phrases and sayings, right? NM: "Definitely, when we were first writing the cards we shared the cards with our East Coast friends to see if colloquialisms were the same. We're West Coasters all the way." TM: "We're also planning to come out with new games in early 2017, we'll say it's going to be for the same audience and the same humor. Don't want to give too much away but it'll be a party game, social but casual with a strong humor aspect. Why are the cards numbered? TM: "Part of the reason was because we liked how it looked." NM: "Plus we liked the sharing aspect, you can tell your friend they are a #39. Then we actually have cards crowd-sourced from fans, so people can say 'This is my card, check out #35.' Adds a little ownership, makes it easier to find." TM: "The expansion pack has a lot of cards people submitted, so it's a fun way to claim your card. It has their location and name." When did you start incorporating player's cards into the mix? TM: "The player's cards in the first game were just our friends who submitted cards or wanted a card in the game but that's because we didn't have an audience to crowd-source cards from initially. Now that we do have an audience to crowd-source from they are mostly coming from our website submissions!" So let's go through a few cards so we can get to know you two a little better. NM: "That's definitely Trevor, he's more prepared. I was talking to people about our game recently and didn't have a business card so they probably thought I was making it up." NM: "On a drive from Portland to San Diego, when we were writing all these cards and we used Tinder swiping right the whole way down." CBE: So you never swiped left? NM: "No, I'm a positive person, so 800 tinder messages later, I just started messaging people weird facts about wolves and the earth, so I started taking screenshots and made an Instagram account for it, it's @ImgoodatTinder on Instagram. NM: "I think that's our dad.."
TM: "No it's me, I've done it." NM: The way our plan is set up my mom, dad and brother get their upgrades first and I'm last on the list. So I end up being the one with the shattered, old iphone." NM: "To be fair I did at one point own an American flag shorts and had an American flag cooler. I also had a shirt with a wolf and an eagle." TM: "Sun's out, guns out." NM: "Trevor got into the gym lifting routine many years ago so he's got the six-pack." NM: "My brother and dad would be calling on a Friday, when I didn't have classes and then give me a hard time for sleeping in but I know Trevor did it too when he was in school." TM: "That could go either way. When we would little we would do this thing where you fill a cup and put all the condiments in the fridge and one of us would drink it." NM: "But, Trevor's pretty cheap, back in high school Trevor would do anything for $5."